I’m working on a paper that will be submitted for publication. It mostly records and expands on my NCTM presentation in Denver a while back. Along the way, I decided to a bit of looking into the claims I have made about the standard view of what it means. I did it the lazy way. Google search on “Ready for Calculus”. I did find one that had a different nature. The most important precalculus concept is the notion of a functional relationship between two variable quantities. This relationship may take many forms: linear functions, power functions, exponential functions, logarithmic functions, trig functions, polynomial functions, rational functions… Functions from these basic families may be combined, transformed, and inverted to produce still more functional forms. Functions also appear in various representations: formulas, graphs, data sets… You will have to be familiar with the basic families of functions, and all of their representations, in order to succeed in your study of calculus. 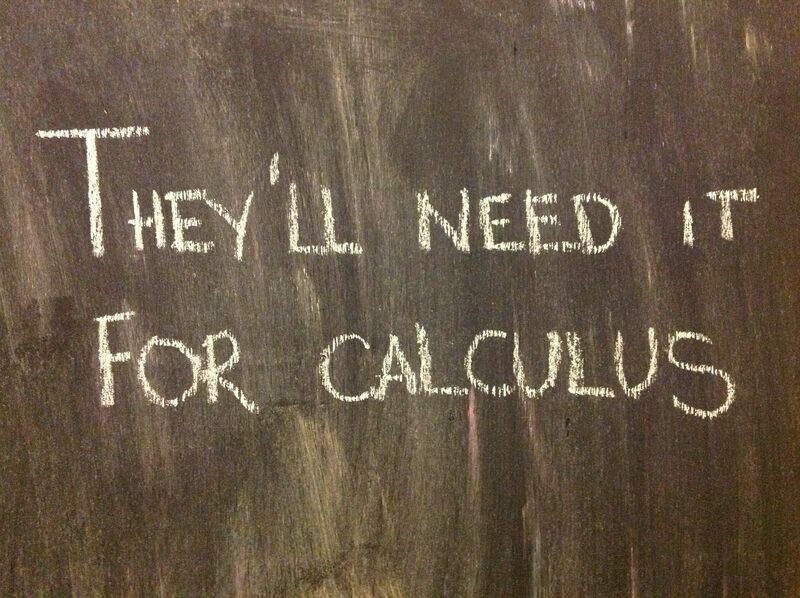 The concept of function underlies everything that calculus considers. And now let’s all imagine how a community college developmental math program that took Exhibit D more seriously than Exhibits A—C would be different from the present-day state of affairs. This entry was posted in Curriculum and tagged calculus, college algebra, developmental math, precalculus. Bookmark the permalink. Some of the early and most beautiful (in my subjective opinion) developments in differential calculus focused primarily if not entirely on relationships that were very much not “functional.” At times, the overemphasis on functions in early calculus courses pains me. Super interesting response, R. Wright. I had not expected pushback on my support for Exhibit D. May I look forward to reading your own interpretation of what it means to be Ready for Calculus? I will gladly amend the intent of my writing to pointing to being ready for calculus as it is currently conceived in mainstream high school and college classrooms, rather than being ready for calculus as it ought to be taught. My experience with teaching the subject is far too limited to support strong claims yet about how it ought to be differently structured. OK…one exception to that. The idea of studying limits before studying the reason we study them is silly and must be immediately abolished. Limit, Derivative, Integral is based on mathematical formalities, not on how people learn things. I could get behind Derivative, Limit, Integral quite easily. And surely others have considered different permutations of these; all of which I am happy to consider, except those that start with Limit. Other than that, though, I got nothing. I wouldn’t say pushback. Exhibit D definitely has the best spirit of the four, especially in preparing for what calculus has become in schools. It just happened to make me realize a different way that, in my opinion, the roots of formalistic-calculus-readiness run backwards through the curriculum. The idea of studying limits before studying the reason we study them is silly and must be immediately abolished. Oh, totally. There was a presentation I read a while back (maybe you even referred it to me) that said limits are not the core idea of calculus — the “d” operator is. Or something to that effect. I might be mixing that up slightly with Lockhart’s “Measurement,” which conveyed largely the same message (along with a decent outline of roughly how I think a calculus should begin, in the latter parts of the book). Last year was the first year I got rid of my precalculus review unit in my AP Calculus course. I instead started in with a unit previewing limits, derivatives, and integrals. I didn’t miss the precalc unit, and neither did the students. It wasn’t a problem to pick up odd algebraic tricks here and there as we needed them through the rest of the course, and we used the extra time to do conceptual explorations of those concepts in the first couple of weeks. In the past, that unit really reinforced the hierarchy of achievement that had been established in the precalculus course: some students got it, others didn’t, and those that didn’t were starting off the year from behind. Getting rid of it got everyone at the same point of exploring completely new ideas together. A much better situation for all people involved. A very interesting point and a really nice set of ideas to follow through on.